The Velmex BiSlide positioning stage's modular design makes it highly configurable for a multitude of motion-control applications. The systems can be used to position, align, measure, test, fixture and machine, to name a few uses. Exceedingly accurate, multi-axis systems can be quickly and easily assembled using the BiSlides. Because BiSlide components are interchangeable, they can easily be reconfigured as the need arises. One, two and three axis systems are created by simply bolting together standard components utilizing the advantages of T-slot framing. BiSlide Assemblies have a load capacity of 300 lbs. (136 kg.) horizontally and 100 lbs. (45.4 kg.) vertically. BiSlide configurations come in travel lengths from 5″ (12.7 cm) to 80″ (203.2 cm). These dovetail stages can be manual or motorized. The belt-driven BiSlide Assembly can travel up to 228" (579.2 cm). Get models, styles, specifications and other details. 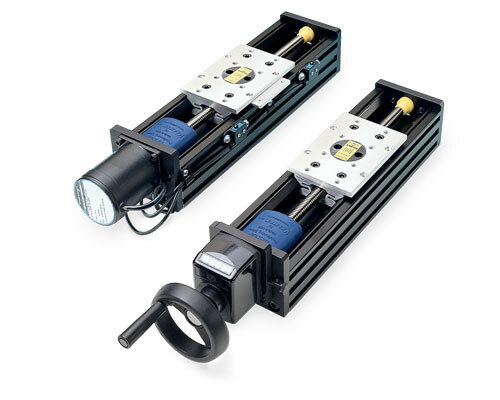 Velmex offers several pre-configured specialized BiSlide systems including the Side Knob BiSlide, Parallel-coupled BiSlides and Belt-Driven BiSlides. BiSlide Assemblies can be the basis for a Petrographic (Concrete) Analysis System.